Do you know what a palm branch looks like? Some of us wave them on Palm Sunday. Why do we celebrate with palm branches? Jesus knew this was his last week to be alive. Soon, He would be crucified. There was much to be done and taught. We celebrate many of these last events. The first event in that last week, we call Palm Sunday. 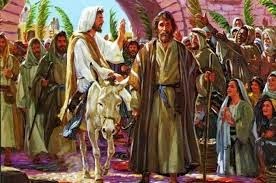 Palm Sunday is special because Jesus Christ rode into Jerusalem and the crowds praised His name and waved palm branches. The day started early with Jesus coming to Jerusalem and the people heard He was on his way. They waved palm branches and shouted “Hosanna!” Hosanna means, save now. Jesus sent two of His disciples to get a colt. A colt is a baby donkey. This colt had never been ridden. Can you imagine someone climbing on a donkey that hadn’t had a person on it? The colt would buck and complain. Amazingly, this one didn’t because he knew who was going to ride him. How proud he must have been that the Lord had chosen him to ride. The disciples brought the colt to Jesus and draped their coats across its back. The crowd shouted. “Hosanna!” “Blessed is He who comes in the name of the Lord!” “Blessed is the kingdom of our father David that comes in the name of the Lord!” “Hosanna in the highest!”(Mark 11:9) Some took off their coats and robes and place them on the road. They cut more braches, with masses of leaves, to wave before Jesus. Jesus drew near Jerusalem and he gazed over it and cried. He knew what was going to happen to Jerusalem. It would be destroyed completely with not one brick left upon another. The people of Jerusalem, especially the spiritual leaders, had been given the chance to believe in Him as the Messiah, but they chose not to. They were going to kill Him in just one week. This day was filled with happy shouts and laughter—yet was filled with sorrow for our Lord. He understood and took His rightful praise which brought Him joy but in his foreknowledge, He was troubled in His spirit. This day, Palm Sunday, is a joyful occasion. We celebrate the fact that Jesus is King. He rode into Jerusalem and the crowd acknowledged who He was. He was the Messiah, King, and the Christ. 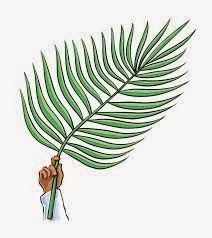 Now, with more understanding, may you celebrate Palm Sunday!